United Conservative Party Leader Jason Kenney's favourite snack food is movie theatre popcorn. Kenney and the crew of CBC Radio show Edmonton AM chowed down on the salty, buttery snack during the latest edition of the show's Snack Checker competition. The weekly segment seeks to find the city's best bite-sized eats. And we believe snacks have the power to transcend any political divide. Last week Premier Rachel Notley offered up spinach fatayer, a Middle Eastern delight, from Sun Bake Pita in North Edmonton as her pick for Edmonton's ultimate snack food. The morning show crew thought having an offering from the political opposition could balance things out. Kenney delivered with a decidedly different snack and a slightly salty comment about Notley's gastronimical pick. 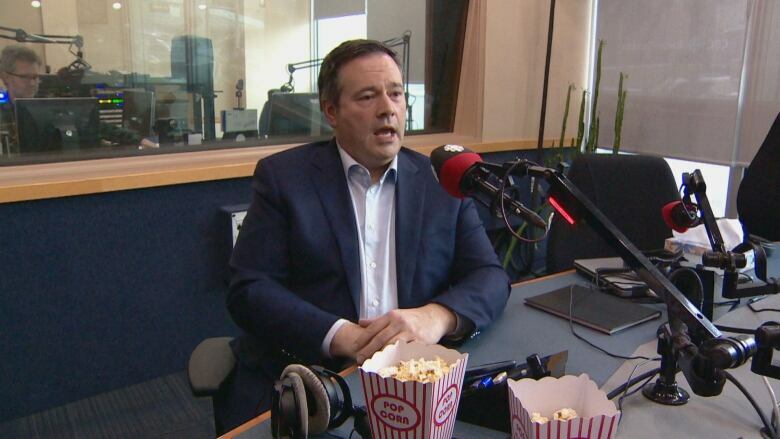 "I have honestly, many times, gone to the theatre mainly for the popcorn and the movie is just the excuse," Kenney said. "I heard the premier came in with spinach. To me, that is so NDP, telling people to eat their spinach." "I'm just making the case that popcorn is one of the highest sources of fibre you can get. It's fun, it's associated with fun, with movies, and it's good for your body," Kenney said. "Now you're going to be saying, Kenney is telling the masses 'Let them eat popcorn.' "